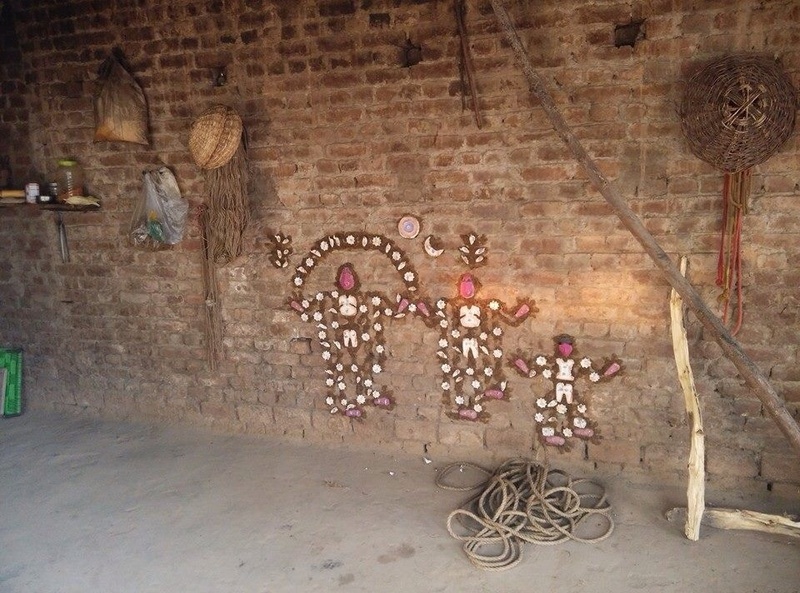 When we were small boys, every year ten days before the festival Dussehra, our mother would choose a small area on one of the mud walls and make a crude image of a woman, stars and moon and bullocks with the cow dung. We lived in the village. Almost everyone has some land on which agriculture was done. Also there were plenty of animals like cows and buffaloes. Houses were made of mud and walls and floors were plastered with wet cow dung. We did not understand all this and thought this as some folk art. It was called Sanjhi. Now this ritual has almost vanished like many other rituals which were observed in the rural parts of the country. 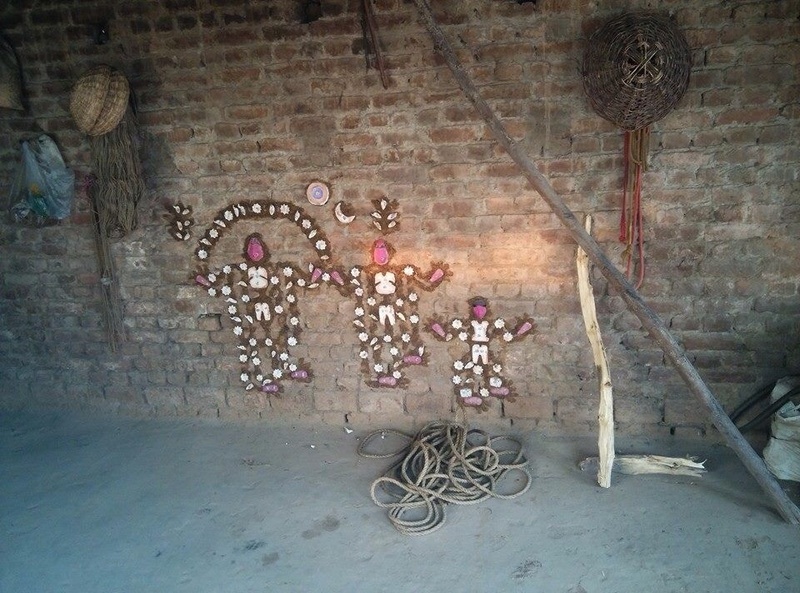 The images slightly resembled the Warli art. Both were drawn almost in the straight lines meeting to form triangles and squares. The image is called Sanjhi and established on the first day of the nine days of Durga Puja or Navratras. In fact, a common thread runs throughout India and festivals have the similar philosophy behind them. Only the style varies from place to place. Even days coincide. The images of Sanjhi are suggestive of Durga, Uma and Katyayani. And just like Durga Puja in which the idols of the deity are immersed in the river waters, Sanjhi festival also ends with the immersion of Sanjhi on the day of Dussehra. The festival is observed mainly in Haryana and Punjab. The girls offer prayers and food to the goddess everyday. These shapes including stars, moon, sun, face of the goddess etc are given different colors. The star-studded collage is fixed on the wall of a dwelling, facing south, in the later half of the early October or late September months. In some places, the image of Sanjhi is painted on the wall. The art of Sanjhi is quite native and simple. Apart from the various forms of Sanjhi created on the first day of the moon in Kartika, there are some other rituals observed by girls during the Navaratras. Devotional songs are sung just after dusk. Lighted earthen lamps are held by adolescent girls who assemble around Sanjhi. 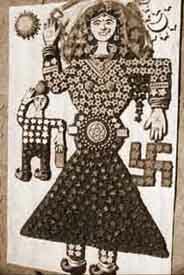 They sing chorus songs, that are centuries old, to please the goddess. The girls, who sing these songs are rewarded by their elders with token money. The girls believe that by appeasing Sanjhi they will get a good husband. In one of the songs, Sanjhi is asked about her basic needs — what would she like to wear or eat. In another song, the girls promise to appease her by offering presents. This low key group activity is held every evening for nine days in front of the Sanjhi image put up on walls. On the tenth day of Dussehra, the images from the walls, along with the cow dung used as an adhesive, are scratched and removed. Only the head of the figure is securely contained inside a small earthen vessel whose belly has been ridden with several holes. In the evening, the girls with their respective earthen vessels float their lighted pots in the village pond. The vessels are hit with cudgels by the village youth to stop the bowls from reaching the other end. A legend says that none of the bowls should float across the pond and touch the other end, otherwise misfortune would fall on the village. Reblogged this on my theatre world. I picked up Sanjhi word in class 10th or even before that in my school days. Since then this word travels with me to aim a dream. And today first time, am reading about Sanjhi festival, thanks for sharing. Interestingly I could see some sights of sanjhi festival this October during a village visit in Faridabad but even then I wasn’t knowing much about it. I just enjoyed seeing cowdung made Goddess symbol on some walls and happily clicked photo from my mobile and that was the end of story. I am looking for the songs which are sung on this occasion. Can you please help? Sanjhi has just been immersed in the rivers. I loved this post. Such a beautiful, nearly forgotten festival. Thank you sharing and in a way, keeping it alive. Thanks Ranjit ji for sharing this wonderful article ! I just want know the history behind this festival. I used to enjoy sanjhi puja till I was staying with my grand ma, and it vanished after she passed away. Today after many years, felt nostalgic for this festival. And really feel sorry that we don’t see this festival celebrated the way it was done before. Glad I found your write up. Thanks a lot Ranjit ji for posting this beautiful ritual here and keeping it alive among us. Hi Ranjit, Good work done. well can you please put the pooja for Sanjhi which is done every evening.